A kitchen fire can start simply enough when a pan on the stove gets a bit too hot or is left a little too long. But it can quickly become a major problem to a structure and its occupants. That’s what happened recently for a family in Jupiter, Florida. They were cooking with grease, which got too hot and caught fire. Thankfully, they were able to contain the fire to the kitchen. Not before, however, the soot, ash, and odor had a chance to permeate the entire home. 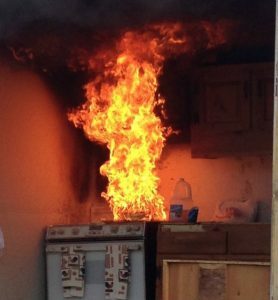 The most common type of kitchen fire is a grease fire. Grease fires most frequently start on the stove or in the oven, with 62% of cooking fires occurring on a stove top and 18% occurring in the oven. First and foremost DO NOT pour water on a grease fire. This will cause steam to form, which can result in spatter, spreading burning grease to any flammable surface, including clothing or the wall behind the stove. To put out a grease fire, turn off the stove and cover the pan with a tight-fitting lid or baking sheet. If you don’t have these tools, do not try to pick up the pan because you could burn yourself this way. If you don’t have a lid, you can put out small grease fires by pouring baking soda on them. If the fire is too big to cover up, you’ll want to have a fire extinguisher ready. Fire extinguishers that are labeled as K or ABC are designed to safely put out grease fires. Stand a few feet back from the fire so that the pressure from the extinguisher doesn’t push the fire onto the wall or the stove. Pull the pin on the extinguisher and sweep the extinguisher in a side to side motion while aiming at the fire. If the fire gets too big and continues to spread, it’s safer to just get out of the building and call 911. A simple kitchen fire can end up being a complicated and devastating experience. But just like with the family in Jupiter, Joe Taylor Restoration knows how best to remediate your home or business after a fire. Whether it’s a kitchen fire that started with grease on the stove, or any other type of fire, call us to reach the experts in fire restoration.